This spicy red pepper hummus is so easy and delicious you will never buy it pre-made again. If you ask any of my friends, they would tell you how much I enjoy entertaining. I love cooking for a picnic at the Hollywood Bowl, creating small dinner parties for friends, even making a dish to take to a potluck. I realize not everybody shares my passion for cooking and sharing this way so if that is you, I have some great news. “Bring it! 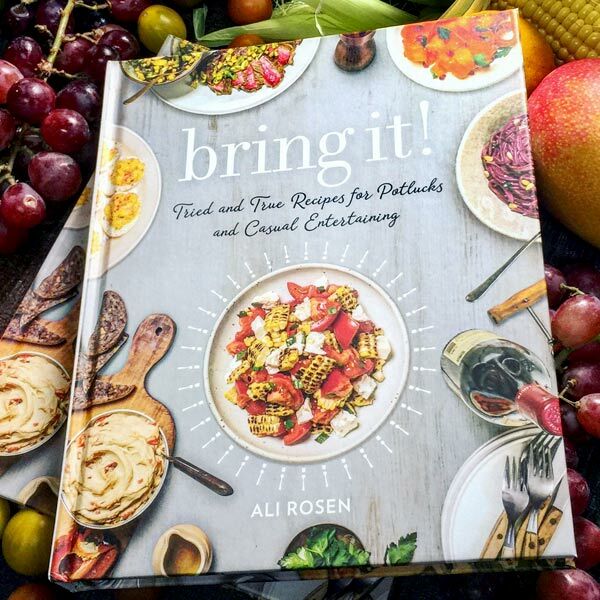 Tried and True Recipes for Potlucks and Casual Entertaining” by Ali Rosen is just what you need in your kitchen arsenal to look like a culinary queen even you’re not really feeling it. With this book, you’ll be won over, and you’ll get the crown next time you have to bring a dish or throw a party. Bring it! is full of easy and delicious recipes which, with a little planning, will keep the stress away from the party. In addition, and one of my favorite things about this book is the dishes are designed to come together easily, travel beautifully, and delight even the pickiest of palettes. In this book, you will learn how to transport and store food, how to make dishes that can safely sit out at room temperatures as well as endless helpful tips and clever shortcuts. 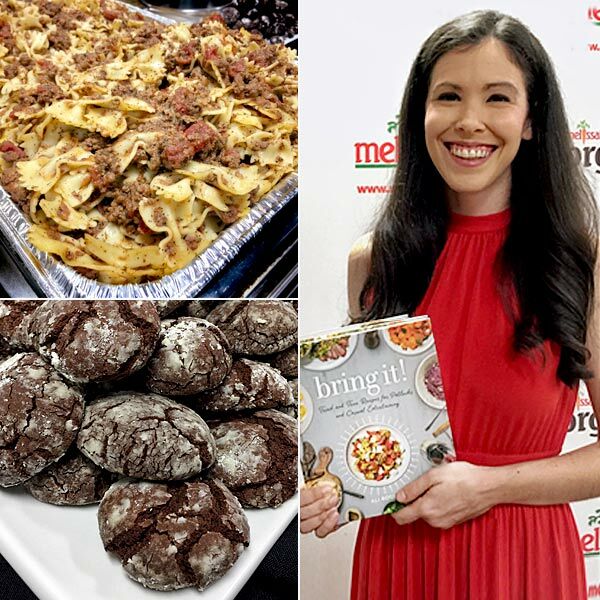 I recently met Ali Rosen at Melissa’s Produce media luncheon and here are a few dishes we sampled. Ali’s recipe for deviled eggs is the classic version with the surprise element of shrimp, which added a delicate umami that wouldn’t have occurred to me. The combination made for a creamy, tangy, buttery morsels with a hint of sweetness that, you’ll see, will win everyone’s heart. 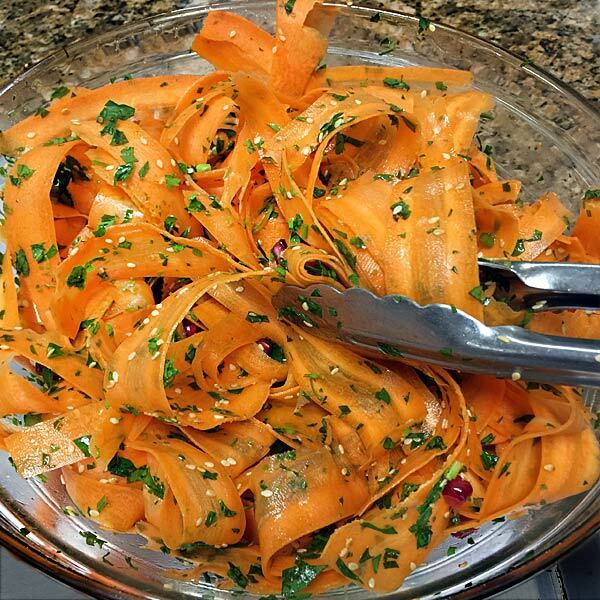 Ali demonstrated how easily this beautiful Carrot Salad comes together. Carrot Shaved Salad with Pomegranate and Parsley dressed with a savory sesame dressing. Forget lettuce that will go droopy and lifeless, instead bring this brightly colored salad that will stand the test of time as well capture the attention of anyone passing by. 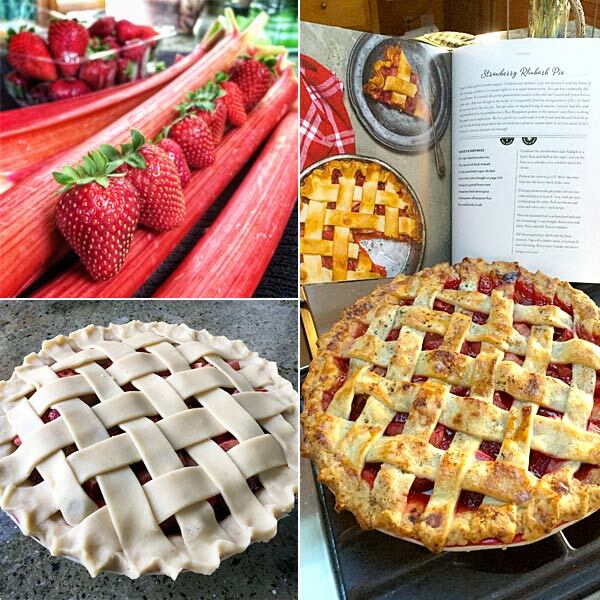 Once I got home I jumped right into Ali’s Strawberry Rhubarb Pie – this Midwest girl’s favorite pie. It was luscious! You can’t go wrong with perfectly ripe organic strawberries from Harry’s Berries and ruby red rhubarb both provided by Melissa’s Produce. And then there was that potluck I was invited to, where the host asked me to bring an appetizer, so I made Ali’s hummus, which has a bright twist. I am always shocked when people buy hummus. It couldn’t be easier to make and it is so much more flavorful when you make it yourself. What really makes Ali’s special is grilling the red pepper, something you can do right on your gas stove, or under the broiler. Meanwhile, you can throw the rest of the ingredients into a food processor, give it a whirl and the base is done. Depending on how creamy you like your hummus you can add more liquids such as lemon juice, olive oil, or liquid from the precooked chickpeas. Fold in the diced peppers and you are ready to go. I like to drizzle with olive oil and serve with pita chips or Persian cucumbers. The red pepper gives this hummus visual appeal and the cayenne kicks it up a notch making this recipe a winner. If you have a gas stove, turn a stovetop burner on high heat or turn on the broiler. An outdoor grill also works well. Use tongs to place the red pepper directly on or under the flame, and cook for minutes on each side, approximately 8 minutes or until the pepper looks almost completely charred. Set aside to cool. Drain the chickpeas but save 1/8th cup of the liquid from the can. Combine the chickpeas, lemon juice, tahini, garlic, salt, pepper, coriander, cumin, cayenne, and oil in a food processor or blender and blend until creamy and smooth. Make sure to take the time to scrape the inside of the canister a few times as you blend. 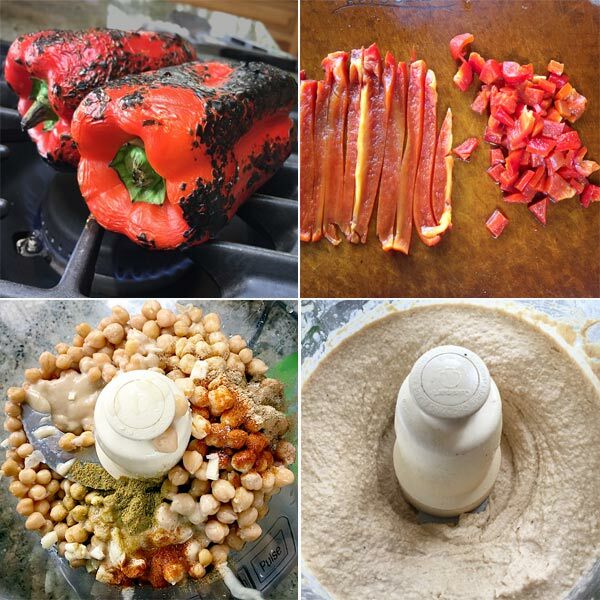 When the red pepper has cooled, scrape off the majority of the charred skin (as much as you can), core, seed, and dice the pepper, and fold into the hummus until smooth. 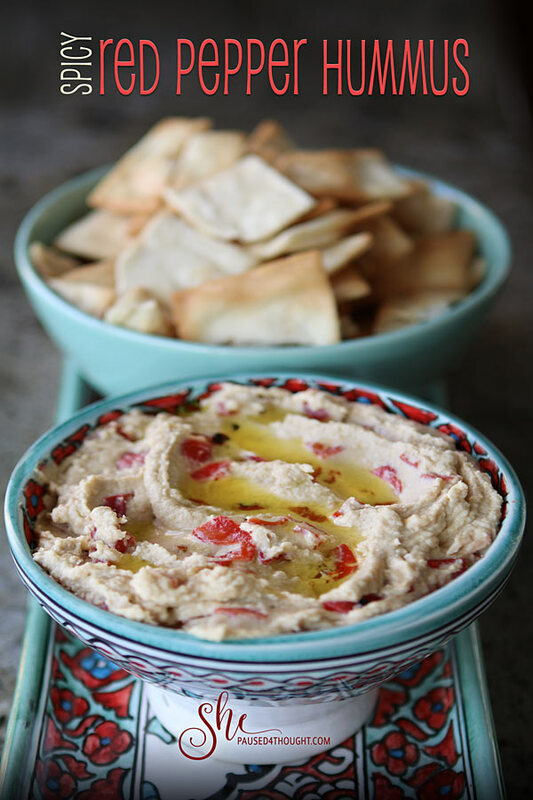 Here are Ali’s tips for her recipe of Spicy Red Pepper Hummus. This dip can be made up to a week ahead as long as it is stored in an airtight container in the refrigerator. Just give it a small stir before you put it out. I recommend serving it with pita bread or chips. A lot of substitutes will work fine in this dish. 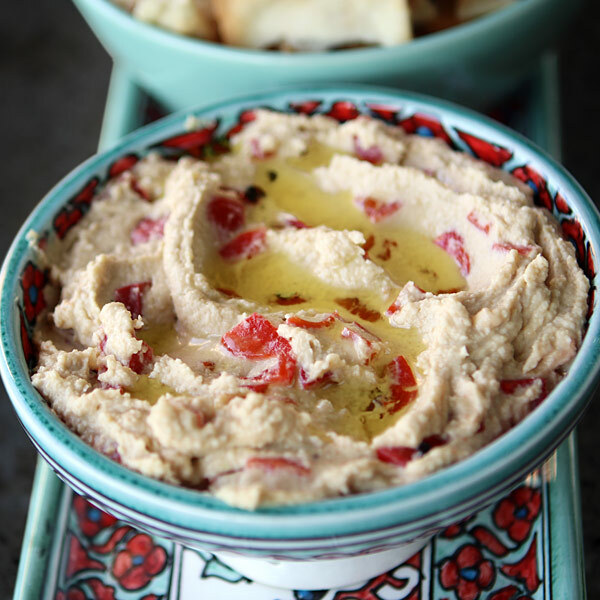 Making the hummus base or the roasted red peppers from scratch is great, but you’ll closely approximate the recipe if you buy either the hummus or roasted red pepper pre-made. The point here is to put a spin on your basic hummus with some texture and spice. Just blend the garlic, coriander, cumin, lemon, and red pepper into pre-made plain hummus, and you’ ll be all set. Roasted red bell peppers are easily purchased: substitute 3/4 cup of drained, diced jarred peppers. You won’t have quite the same texture but you will still get a lot of the red pepper flavor. If you can’t find tahini you still could make this dish: while it adds a lot and I would encourage you to try and find it, in a pinch you can just add an extra tablespoon of olive oil. Just keep in mind that it won’t come out quite the same. And if you don’t want any spice, simply omit the cayenne. The word pot-luck first appears in the 16th c. and is said to mean “food provided for an unexpected or uninvited guest, basically – the luck of the pot.” The modern interpretation of this word is a “communal meal, where guests bring their own food,” and it most likely originated in the 1930s during the Depression when guests shared the expense of a meal. Whether you use “Bring it! 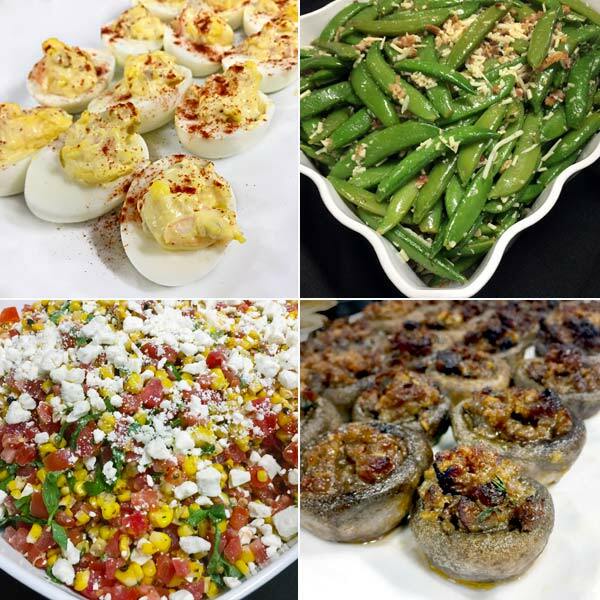 Tried and True Recipes for Potlucks and Casual Entertaining” for potlucks or entertaining at home, it will simplify the process without sacrificing flavor. Disclaimer: I was given a copy of “Bring it! Tried and True Recipes for Potlucks and Casual Entertaining” to review. All opinions are my own. Previous Post: « Why travel to Oman? This appetizer sounds delicious and you’ve plated it just beautifully, as always! 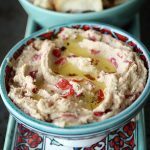 I agree, homemade hummus is so easy to make and the red peppers and cayenne sound like wonderful additions perfect for a potluck! Thanks Sue, the dishes came from Morocco. They make everything in them look festive. They cayenne is a wonderful addition to the sweetness of the red peppers. The. hummus recipe looks delicious, we were served hummus most every lunch in Oman. Looks really good! Your new web design too! Thanks Nan. Pretty tasty too. My favorite hummus flavor is when it’s made with red peppers, but I’ve never had it spicy! YUM! I have to make this next time. What a great idea for a cookbook! Instead of poring over endless cookbooks and recipes online, this has all the best options ready to go for a take away meal or dish! Brilliant! I love adding flavors to Hummus — this recipe sounds divine. And what a great book, which will indeed serve you well during Bowl season! Love the new “look” and as always, your photos are stunning! Thanks Valentina! It is a fun book. I make hummus every Sunday and thought I had tried most combinations, but the spice with the red pepper was a winner. That carrot salad looks incredible too! What a lovely recap of your adventure! Sounds like a must-have resource book. Yes, that carrot salad was delicious. This book is perfect for people who need to travel food or like no-fuss entertaining. Love the spicy hummus… and the carrot salad that won’t get soggy!!! Will definitely use these!!! We potluck a lot on my tennis team! Thanks Cath!